Onam Sadya is a meal with combination of various taste and flavours. This ginger pickle is served as a digestive in this sadya menu. Ginger helps to digest the heavy meal. So it is prepared in the form of Inji Curry, Inji Theeyal or Puli inji for the onam sadya. I have already shared Inji curry recipe in my blog. You could check that too. 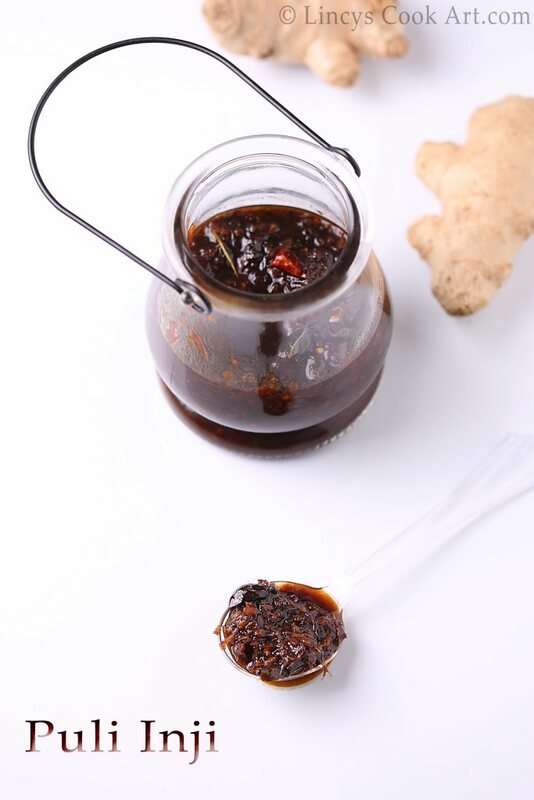 The main ingredients are ginger and the tamarind in this yummy pickle. Apart from that chillies are used for heat and jaggery is used to reduce or balance the heat from ginger and chillies. Tangy hot and sweet pickle. Finely chop the ginger and cut the green chillies as thin roundels. You could crush the ginger slightly in blender jar if you wish to avoid biting ginger in the pickle. Soak the tamarind in 1 and 1/2 cups of water. Crush/ grate the jaggery; setaside. If the jaggery is not pure dissolve in hot water or make syrup and strain it and use. Heat oil in a pan and add mustard seeds and fenugreek seeds once the mustard seeds starts to pop and the fenugreek seeds starts to get golden colour add the dry red chillies. Now add the finely chopped ginger and green chillies, Asafetida and salt together and fry in that oil. Fry the ginger on low to medium flame till golden brown colour starts to appear. Now the ginger volume reduces to half and feel light and starts to give nice aroma. At this stage add the soaked tamarind water and allow to cook for 5 minutes. Now add the jaggery and allow the mixture to cook and reduce to form semi soild gravy consistency. It should not be watery or too thick. Note: To get darker colour use aged tamarind and dark colour jaggery. You could start from sauteing ginger in oil and follow the same procedure and finally do tempering separately and add. I have not done separately to avoid excess use of oil.